If you want to learn the true meaning of 'positive reinforcement', go and work in a primary school. The year I spent there in the office drooling over the stationery supplies was remarkable for all the appreciation that came my way every day from the teachers. They even gave me stickers! Which makes me feel bad that, after our lunch together yesterday, I sort of hope those kind, cheerful ladies spent the night rolling round in bed clutching their stomachs and making multiple trips to the bathroom - because that's what I did, and if it wasn't the sushi at lunchtime, then I'm going to have to blame my own cooking in the evening. Like Jerry in 'Seinfeld', I rarely vomit. 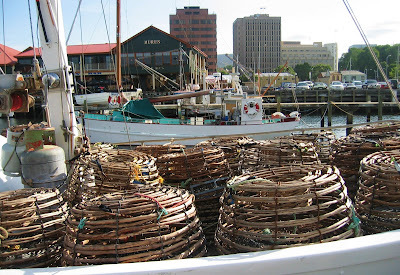 It's such an event that I remember each time; and the last was in 2003 in Hobart, on my first night in Tasmania, after (but, in the mysterious ways of food poisoning, probably not because of) what had been a delicious salmon dinner at Mures down by the harbour. (Note: salmon doesn't taste so good in reverse.) Even worse, it blocked the toilet, and I felt so guilty about what the chambermaid would have to cope with that I left her a note of apology and a tip. Except, I don't do tips - New Zealanders don't know about such things - and now I look back at that miserly $5 and blush.